Computer Girls is an initiative to get more women in technology – from beginners to professionals. From 2014 to 2017, this program was funded by the Ontario Trillium Foundation in collaboration with Women’s Enterprise Skills Training Inc. This three year grant developed curriculum, classes, workshops, networking events, and community events to highlight the gender gap in tech and support women in STEM fields. Almost half of all Computer Girls participants wrote their first lines of code at one of the classes. These classes were developed by professional female programmers and taught by women in the industry. 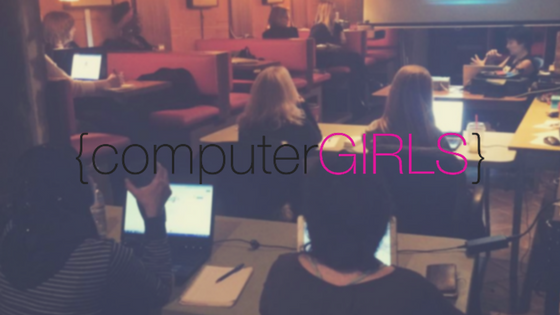 For professionals, we hosted networking sessions and skill building workshops, while highlighting the contributions of female developers in Windsor-Essex. The Computer Girls curriculum and classes were developed and taught by professional computer programmers with the aim to get more interested in coding. These free classes introduced the public to introductory computer programming, with an emphasis on practical applications. Primarily taught at Hackforge and WEST, the program also partnered with the Essex County Library to bring the classes throughout the region. A diverse group of people attended the classes. In the final year of the program, the largest group of participants were between 25 – 35 years old (40%); those 25 and under made up 22% of participants, and 55+ made up 12%. 84% of participants were Canadians, while New Canadians made up 16%. The classes also gave the opportunity for professional female programmers to develop their public speaking and teaching skills. For participants, it gave them an opportunity to meet the women involved in our local industry and redefine their idea of a developer. Part of the Computer Girls initiative is to promote mentorship, networking, and support for women already working or looking to start tech careers in Windsor. Women are underrepresented in computing-related jobs, making up only 26% of all workers. Women of colour are even less prevalent. Anita’s Network hosted Lunch and Learns, networking events, and other professional development initiatives for women in technology. Only 10% of Wikipedia editors identify as women. This event sought to strengthen diversity both online and in our community through collaborative actions that encourage knowledge sharing and skill building. A collaboration between Hackforge, Arts Council Windsor & Region and The School of Creative Arts at the University of Windsor, people of all gender identities took part in Windsor, Ontario’s first Art + Feminism Wikipedia Edit-A-Thon. Hackforge hosted TechTown Detroit Diversity and Inclusion Entrepreneur-In-Residence, Marlin Williams to speak and participate in How To Build a Better Tech Community. She spoke on her experiences, building diverse teams and creating environments where all people feel included. The panel discussion then featured Ms. Williams; Elana Freeman, a project manager for Thyssenkrupp; Lori Dunford, a local computer programmer, and Sarah Mushtaq, an MBA candidate at the Odette School of Business. Moderated by Hackforge Managing Director, Sarah Morris, the panel focused on practical measures and policies that can improve the working situation for a diversity of people in tech.